After that race, Civalli bumped winner Ted Christopher on the cool down lap, reportedly sped through the pit area and then refused to report to the tech area after crossing the line in the second position. Hardie was the early leader of the 40-lap feature, pulling away to a huge margin over second place early on until the handling went away on his #7 car. But, what a difference a week makes. Friday night at Stafford, a 20-car field of SKs took to the track and except for two incidents in the 40-lap race, everyone raced hard and clean. There were close battles for the lead, but without any bump-and-runs or post-race fireworks. 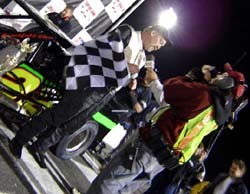 Lloyd Agor was the guy who stood in victory lane at the end of the night, but second- and third-places finishers Frank Ruocco and Willie Hardie were happy after the race as well. Nobody got disqualified or had a war of words after the race. So what was different this week? “I think that it was because of one car that wasn’t in the mix,” said Hardie, referring to the fact that James Civalli was not at the track this week after being placed on indefinite suspension after his antics in last week’s race. Next up, it was Ruocco’s turn out front. He took over the top spot on lap 24. “I didn’t enjoy getting passed, but sometime that happens,” said Hardie. Ruocco had the lead for the next seven laps before it was his turn to get passed. Hardie held on for third. 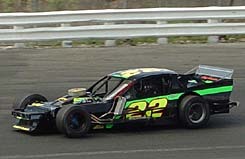 The Modified Tour drivers in the race didn’t fare so well. Christopher was fourth, Malave was fifth, Eric Bernt finished eighth, Donny Lia was 10th after getting caught up in an early wreck and Doug Coby had problems and finished 17th. Agor held on for the victory, which was especially sweet since he was one of the victim from last week’s wreckfest. Agor was also happy to have a good and clean battle with Ruocco at the end. It was a big change between the war or words that Christopher and Civalli had the week before. 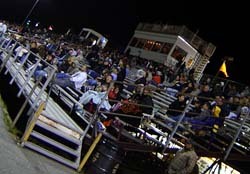 It was a chilly New England night for the fans at Stafford. this past weekend. Rain washed out the PASS, ACT and True Value Modified Series events in Northern New England, as well as all of the Saturday and Sunday weekly shows in the region. Last week, there were a ton of wrecks like this. This week, only two cars dropped out from crash damage.